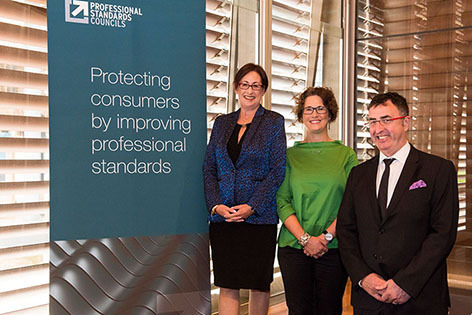 The inaugural Professional Standards Forum, held in Sydney on 11 April 2019, was attended by over 50 delegates who gained valuable insights on how handling complaints effectively and using data can improve professional standards. The Councils’ Deputy Chair, Andrew Lumsden, joined the Victorian Legal Services Commissioner, Fiona McLeay, and CEO of SOCAP, Fiona Brown, for a panel discussion on complaints as a risk management tool. Mr Lumsden examined the opportunities for associations to use their complaints data to understand and respond to consumer experiences of professional services across Australia. Ms McLeay spoke about the Victorian Legal Services Board commissioned research into the legal profession’s complaints data to better understand risk factors to inform efforts to improve professional standards and reform regulatory practices. Ms Brown shared the reasons why people complain and why it is good business to effectively handle complaints. The second half of the Forum was a practical risk management workshop for professional standards and complaints management staff. Nicole Cullen an expert in complaints handling demonstrated how participants could identify the root cause of complaints and how to use this information to protect consumers. The Professional Standards Forum will be delivered again in November 2019 in Melbourne.